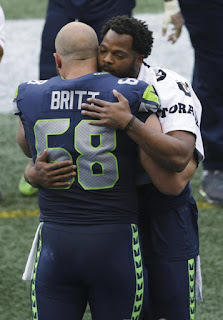 Seattle Seahawks Players Michael Bennett And Justin Britt Protest The National Anthem Before Game !! Britt Protest The National Anthem Before Game !! BHR Hollywood Reports............A few days after sitting during the national anthem last weekend, Seattle Seahawks defensive end Michael Bennett explained how a white player joining the protest "would change the whole conversation." 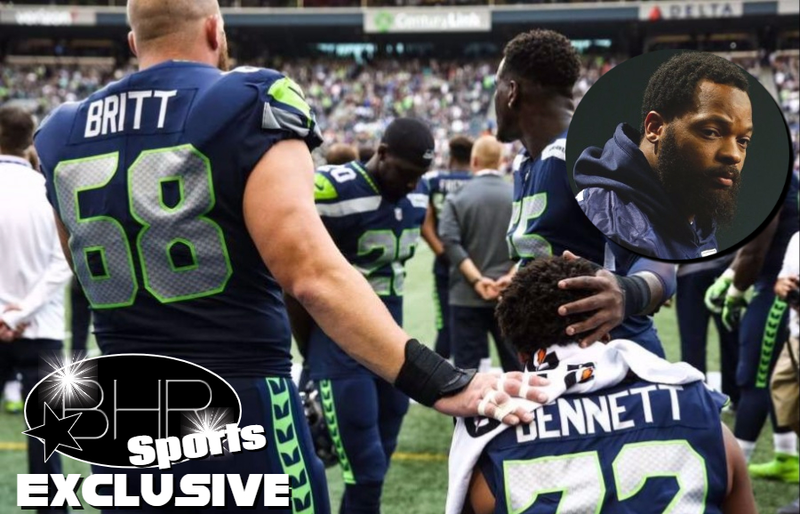 As expected, Michael Bennett continued his protest against social injustice by kneeling during the national anthem Saturday night before the Seahawks faced the Vikings. 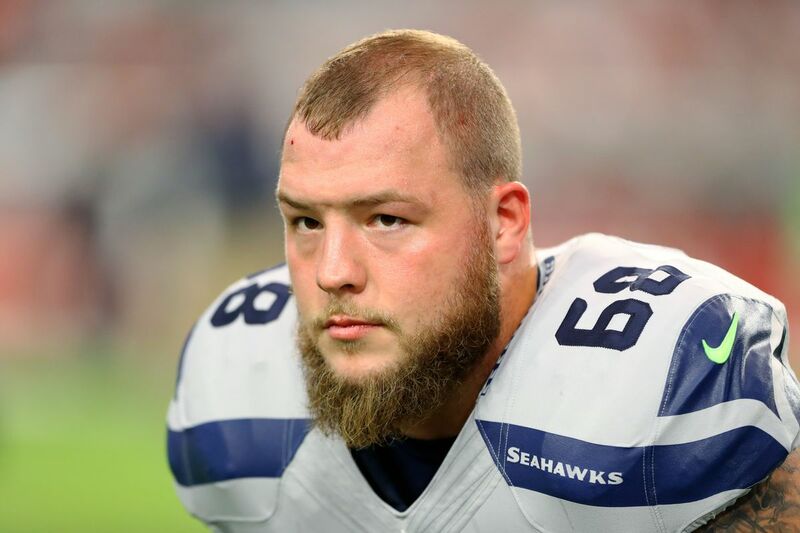 But this time, teammate Justin Britt stood next to the kneeling Bennett and placed a hand on his shoulder. Britt said Bennett's explanation last week for his decision to kneel hit home. "[The violence in] Charlottesville was the tipping point for me," Bennett told reports after the violent "Unite the Right" rally in Charlottesville, Va., left one woman dead and 19 injured. "To see so much hate. 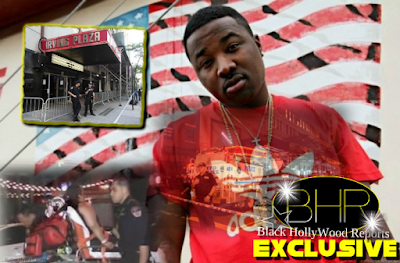 … There was no way I could go out there and hide behind the game." Bennett also called for white players to join his protest. "It would take a white player to really get things changed,". "Because when somebody from the other side understands and they step up and they speak up about it. ... it would change the whole conversation. Because when you bring somebody who doesn't have to be a part of [the] conversation making himself vulnerable in front of it, I think when that happens, things will really take a jump." And those words prompted Britt to publicly support Bennett. "What Mike said, and how he said a white player should do it, that kind of triggered in my mind, because I see what's going on," Britt said after the game, via ESPN.com's Sheil Kapadia. "We all do. And we all have choices whether to be an example or be a follower. I always tell kids: Don't be a follower. Be the one they're following. So whether it's good or bad in some eyes, I feel like I'm just supporting my teammate, supporting why he's doing it and his reasons, and trying to encourage others." Britt continued: "I want to support him. I want to support what he stands for and his beliefs. I'm not foolish. I'm from Missouri. I get that things are different in that area than they are in some other areas. I'm not against what the flag means and veterans. My dad was in the Army. So I'm not putting any disrespect to them. I'm just trying to understand the issues, trying to educate myself more in that regard and showing support. Bennett, who has been outspoken on this issue, was moved by Britt's show of support. "A very emotional moment to have that kind of solidarity from someone like Justin Britt, who's a known leader in our locker room, who's from a different part of America than me," Bennett said. "But to be able to have that solidarity and to be able to have somebody who is behind me and know that it's someone that I really trust, and to see him put everything on the line to support one of his teammates, I thought that was a very special moment." Coach Pete Carroll didn't see Britt and Bennett during the anthem but found out about it later.